Here is some basic information for you on the main problem bat we have in Arizona, their habits and some control methods that we use. The bats most of our complaints come from in metro phoenix is a small bat called the "Mexican Free Tailed" bat. As the name implies they migrate up from Mexico in very large numbers. These bats can be found in areas around your home or business with openings of 3/8" - 1/2" or larger that allows the bat to fly up to and then climb in. Bat droppings or guano look very similar to mice droppings, you will find that around the opening the bats are going into or just below the opening where the bats are getting in. 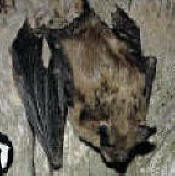 Mexican free-tailed bats occupy a wide variety of habitats, ranging from desert communities through pinion-juniper woodland and pine-oak forests at elevations from sea level to 9,000 feet or more. They are found throughout Mexico and most of the western and southern U.S. The colonies can be found in caves, abandoned mines, under bridges, around homes and in just about any type of building that allows access, but smaller colonies also have been found in hollow trees. It is estimated that 100-million Mexican free-tailed bats come to Central Texas each year to raise their young. Mexican free-tailed bats are designed for rapid, long-distance travel. Their exceptionally long, narrow wings are geared for relatively high speed, low-maneuverability flight in open areas. Even their short, velvety fur appears to be an adaptation to reduce drag, and their ear orientation appears to form airfoils that contribute lift during flight. They have been clocked at average flight speeds of 25 miles per hour and as high as 47 miles per hour in level flight, but they can also attain speeds of over 60 miles per hour using tail winds. Mexican free-tails normally emerge by sundown. Researchers observed bats using radar concluded that most feeding occurred within 528 feet of the ground. Little is known about how far they travel to feed, but given how high and fast they can fly, many likely go more than 50 miles in one direction each night. Free-tails spend more time traveling and feeding each night than most bats, in part due to competition from large numbers of roost mates. They typically are on the wing from dusk until dawn. 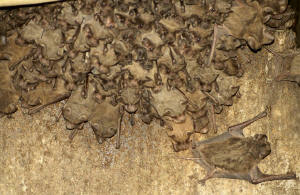 Nursing mothers require at least twice as much food as non reproductive bats, especially as their pups near fledging. At such times, researcher Thomas Kunz found that they may consume their body weight nightly. Never seal up bats inside the void, allow all the bats to escape at dusk and then when they come back at sunrise they find that access back into the roost is closed from them. Bat cones work by allowing the bats to climb out at night, but the tubes are too slick for the bats to climb back up causing the bats to move on to some other location. Copyright � 2011-2012 Arizona Wings-N-Stings All rights reserved. Revised: 06/05/12.